Blown there by the wind. Soaking through the soil, entering the ground water and flowing into rivers and lakes. Rain washes it off the top of the soil and directly into rivers and lakes. "We have more intense storms, so we have more intense runoffs. And because we have more big storms, the phosphorus runs off and ends up in the lake. So that's the reason it's becoming very difficult to control," he said. 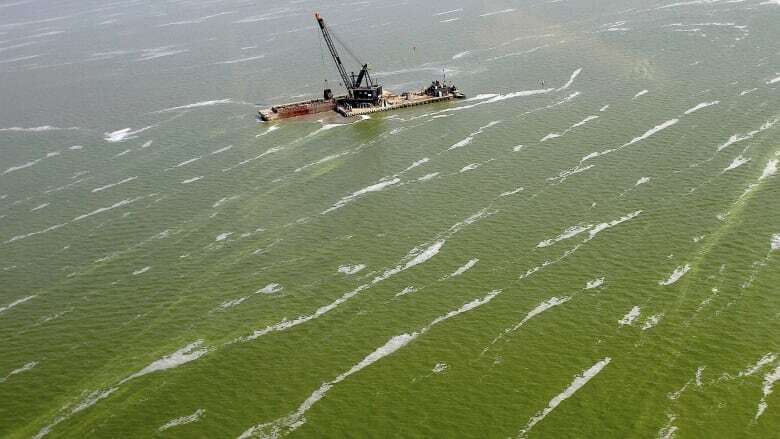 Last year, however, warmer temperatures in March allowed algae to grow earlier in the year, but the bloom wasn't as big as the one witnessed in 2011. "It's a big concern for many people who live on the water," Bejankiwar said. Approximately 40 million people live around the Great Lakes. About 73 million tourists visited the Great Lakes in Ontario in 2010. About $12.3 billion was injected into the economy by those tourists. Approximately 20 per cent of the world's fresh water is in the Great Lakes. The Great Lakes provide drinking water to 30 million people. But it's not just about money. Approximately 20 per cent of the world's fresh water is in the Great Lakes, providing drinking water to 30 million people. "Economics and the environment go together," Bejankiwar said. "If there is no good environment you can't have good economics." Bejankiwar said it's not just the farmers' responsibility to help keep phosphorus out of the water. Residents fertilize their lawns, too. So do golf courses. "This year has been quite a bit more," he said of the algae. "We have a filtration system in our pump hose and within hours it can plug up our filtration system," Toth said. "It doesn't stop me from watering but it just doesn't give me the volume I need." ERCA estimates that at least 100 farmers adopt these some of the practices offered. "I think the big term is that we're stewards of the land," farmer Mark Balkwill said. "We feed our families and we feed ourselves. it doesn't do anybody any good if we're not using sound farm principles."